You may be out of luck if you've been anticipating snow here in Northeast Ohio, but if you've been anticipating buying a fat-tired snow bike, today is your lucky day. We've got one, and only one, of the few available Surly Moonlander bikes in stock! Currently located in our Peninsula store, it's got the Medium-sized (18-inch) frame. You've got to see the Space Black finish of the frame in person to appreciate its beautiousness. 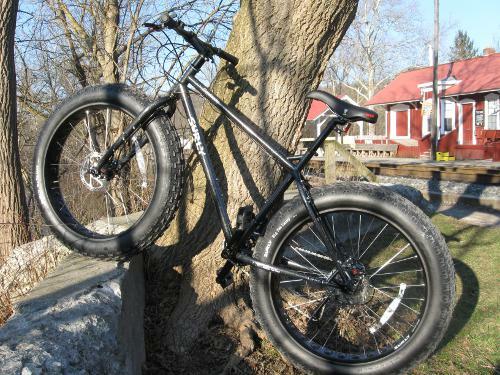 The Moonlander ($2,349.99) is just like a Pugsley ($1,649.99), except Surly has turned it up a notch by beefing up the tires to 4.7 inches wide! You get Shimano Deore and SLX derailers, Microshift thumb shifters, Avid BB7 disc brakes, the Surly Mr. Whirly Offset Double (MWOD) crankset, and Surly Clown Shoe rims with cutout sections to save weight! 11 Days left to Make the Most of Winter! Snow Biking Clinic is ON!